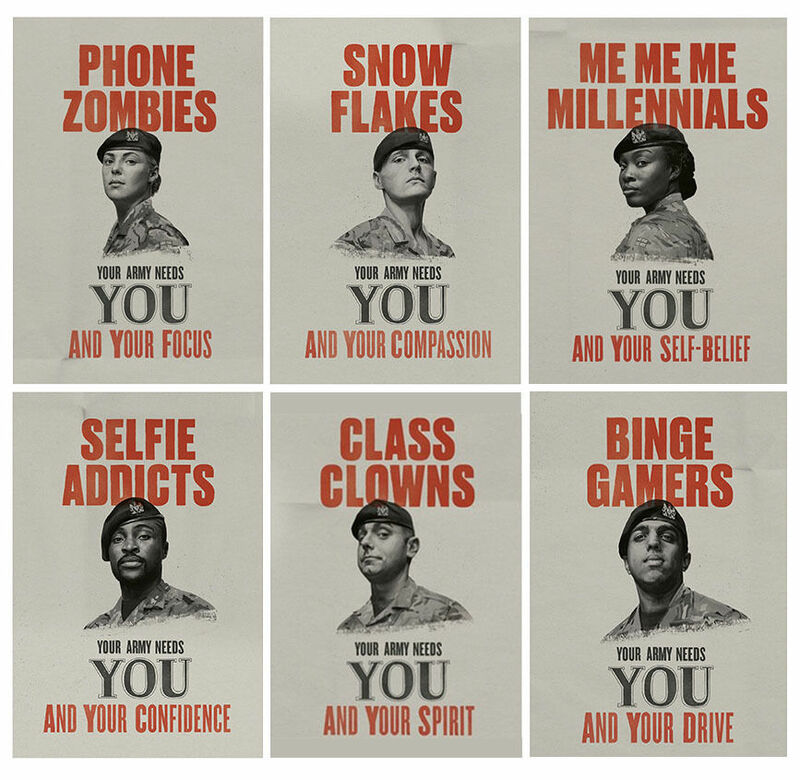 The British Army’s new recruitment campaign targets “snowflakes,” “phone zombies,” and “selfie addicts” - What do people think? That’s not to say many young people today aren’t just as the posters describe—“me me me,” “selfie addicts,” “binge gamers.” What’s shocking is that rather than showing the intent to whip recruits into shape, these posters actually embrace these traits! 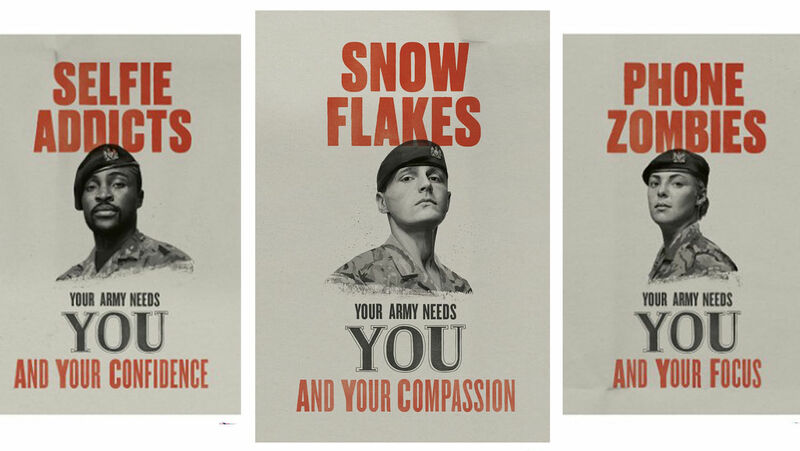 Stating that the British Army needs compassionate snowflakes—focused phone-zombies—confident selfie-addicts. These new posters drew inspiration from the classic World War i Lord Kitchener posters, with some key differences. 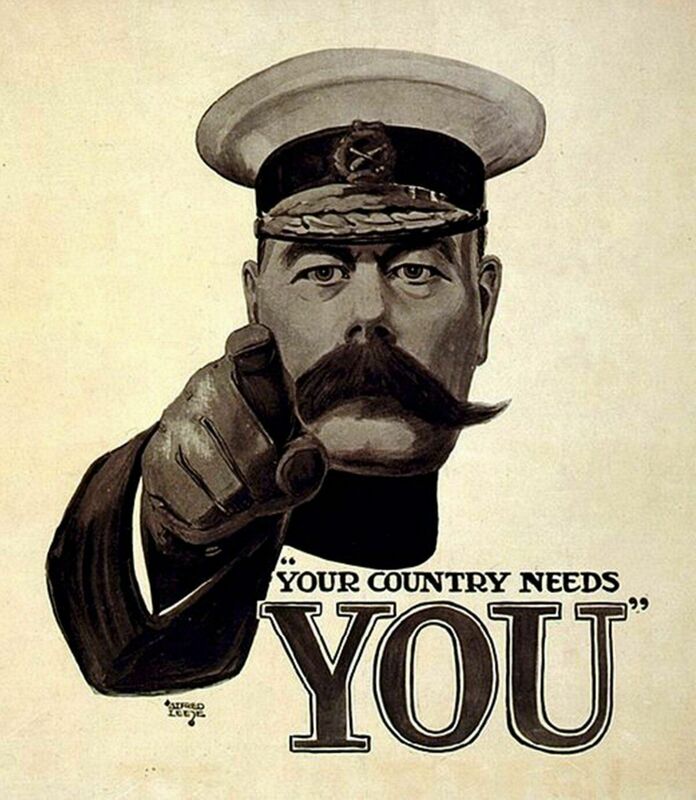 One is that the Kitchener poster declares, “Your country needs you.” The new posters read, “Your army needs you.” This helps solve the problem that many young people in modern, deeply multicultural Britain don’t actually feel loyal to the country. The distinction may help new recruits feel more comfortable entering a separate entity. Ms. Walton says the themes of modern recruitment campaigns remain very different to those of the past. While the original Lord Kitchener image, along with other posters from the period, appeal to a sense of duty and obligation, today the focus tends to be on the opportunity for personal development, she says. So rather than encouraging recruits to have an outward focus of service, sacrifice and duty, the new-and-improved appeal is for an inward focus of self-development and self-service. Then there’s simply the difference in the appearance of the figures themselves. Kitchener strikes a stern pose, pointing accostingly at the reader. Contrarily, the new posters depict faces that are generally quite neutral and soft. But in appealing to “snowflakes,” one certainly doesn’t want to appear stern, much less point at them. Furthermore, the six different posters—a different individual on each—present a full racial and gender spread. Surely many Britons are shaking their heads over this approach. It’s certainly left me gobsmacked—and I’m well inside the target age bracket for this campaign. Understandably, it has left one of the figures shown on the posters—the “snowflake” man—absolutely livid. A Scots Guardsman, he is now resigning from the Army, having not been told that his photo was to be used in this way. Thanks to the Army’s new “cushy” postulating, he has faced a deluge of ridicule. Other soldiers in the Army have been left fuming at the humiliation of their profession by the simplistic campaign. What were they thinking? The Army is desperate for new recruits and evidently pulling out all the stops to try to entice anyone to make up for the 8,000-plus shortfall in soldiers, air personnel and sailors. But really? What does Russian President Vladimir Putin, with his blood-and-guts Spetsnaz, think? What about Iran’s ayatollah and his Islamic Revolutionary Guard Corps? “Compassionate snowflakes” vs. Islamic State headhunters? What has happened to what was one of the most powerful, legendary and feared forces on planet Earth? It brings to mind a couple of biblical verses: “For, behold, the Lord, the Lord of hosts, doth take away … the mighty man, and the man of war … the captain of fifty, and the honourable man, and the counselor … I will give children to be their princes, and babes shall rule over them”; “thou shalt be laughed to scorn and had in derision”; “[t]hose that be near, and those that be far from thee, shall mock thee” (Isaiah 3:1-4; Ezekiel 23:32; 22:5). These scriptures are actually all referencing what is modern-day Britain. And the condemnation continues: “Half-baked” (Hosea 7:8; New Living Translation). “Silly, senseless dove” (Hosea 7:11; Christian Standard Bible). Moth-eaten (Hosea 5:12). A “fading flower” and “drunkards” (Isaiah 28:1). Chasing the wind (Hosea 12:1). “Sick” (Hosea 5:13; nlt). “Dew in the sunlight” (Hosea 6:4; nlt). “As a fowl, fly away doth their honour” (Hosea 9:11; Young’s Literal Translation). Britain “will be ridiculed” (Hosea 10:6; nlt). This is a terrible tragedy, because Britain was once the “crown” of “glorious beauty” (Isaiah 28), a powerful military force (Genesis 49:23-24), and the world’s greatest empire (Genesis 48:19). But it’s not surprising, given that God warned this—and more—would happen as a result of disobedience, culminating in invasion and slavery (Leviticus 26; Deuteronomy 28). Anyone can see how far Britain has fallen, especially over the last several decades. Britain has become a laughingstock before some terrifying enemies. And it is about to be swallowed up by them.